MCLENNAN COUNTY, TX — A man is in custody after stealing two vehicles Tuesday afternoon, according to Waco police. According to police, 32-year-old Christopher Sorel stole an unmarked Waco police vehicle at a car wash on North Valley Mills Dr. According to an arrest affidavit, the police car was being detailed when it was stolen. Sorel had convinced a worker that the car belonged to him, which is when he stole it. Sorel then drove to the 1500 block of Rambler Dr. Police said he got out of the vehicle and threatened a home owner. The homeowner said that Sorel was wearing a police vest and had the emergency lights on. He then got back into the stolen Waco police vehicle, turned on the lights and the sirens, and sped away. He was then spotted in Woodway on Highway 6. Police said Sorel was speeding in the vehicle and a Woodway police officer attempted to pull him over for a traffic violation. He then sped away from the Woodway police officer. Sorel then crashed the unmarked Waco police vehicle and ran on foot to a business on the 200 block of Antler Rd. He then stole another vehicle, a white SUV, and fled from officials. 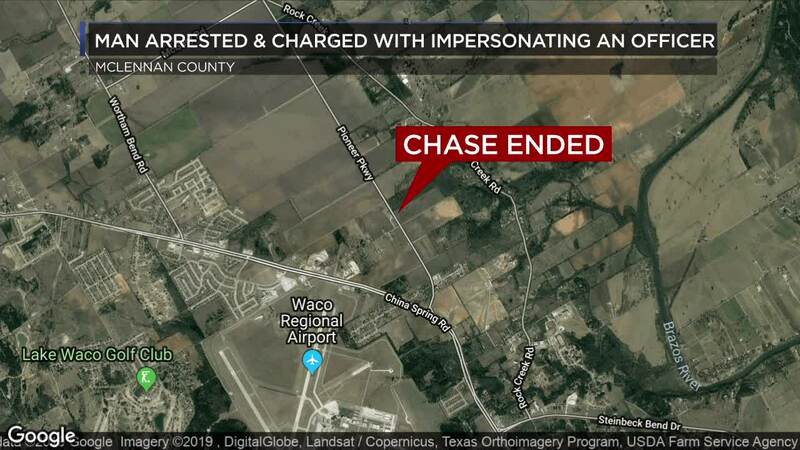 The chase continued and he was then seen in the China Spring area. Sorel then crashed at Flat Rock Pioneer Pkwy where he was then arrested. While being checked out by AMR, he "shoulder checked a paramedic." Waco police, Woodway police, DPS and the McLennan County Sheriff's Office all played a role in the man's arrest. Waco police said Sorel will be charged with theft of a motor vehicle, impersonating an officer and aggravated assault with the Waco Police Department. Woodway police said Sorel will be charged with evading a vehicle, evading on foot and assaulting a public servant with the Woodway Police Department. Police said the McLennan County Sheriff's Office is still working on the second vehicle theft. Police said he will be facing additional charges. Sorel was booked into the McLennan County Jail.